Like most kids, mine was out of school for nine days over the Thanksgiving holiday. This meant lots of quality family time, but since the girls are usually so busy and entertained at school this also meant I needed to find ways to help keep them entertained without any sort of media. Saturday morning the girls pulled out the play dough box only to find out that it was all dried out from the last time they played with it. I could tell their hearts were set on playing with play dough, but since I couldn’t find the cream of tartar we were out of luck there. Last year I made cloud dough for them and they really loved it. This is a bit different than the recipe I tried last year, but the girls didn’t notice. Since I didn’t have any baby oil on hand as I used previously, I improvised with some canola oil instead. I also added in some gel food coloring since traditional food coloring is water based and wouldn’t mix with the oil, to really make things more lively and fun! 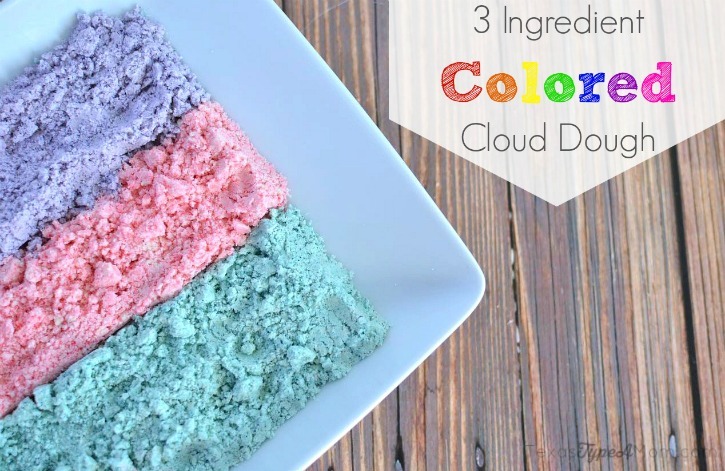 Super simple, non-toxic, baby oil free, colored cloud dough recipe. Mix together flour and oil until thoroughly mixed. 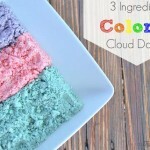 If adding color, use toothpick and continue adding until cloud dough is the desired shade. So, if the girls loved it so much why has it been so long since I last made it? It creates an epic mess. But don’t let this stop you from making cloud dough. 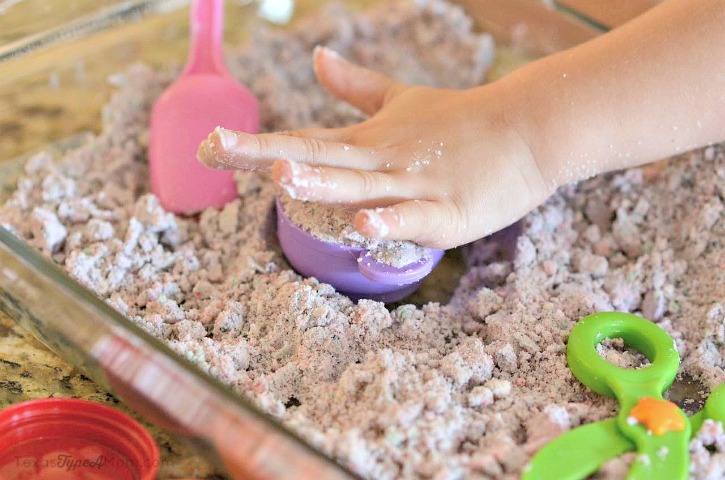 Your kids will love it, but you have been warned that due to the consistency it’s messy. The last time I made cloud dough it took me a good 45 minutes to clean everything up using my old vacuum. Playdough, cloud dough, any sort of doughiness that creates little balls or leaves the tile strewn with remnants makes my husband twitchy so I timed it for when he was upstairs. This time, cleaning up was super easy! Before leaving on our Thanksgiving trip, I went to Walmart to shop for our road trip snacks and ended up leaving with the Eureka SuctionSeal 2.0 vacuum. I already have a Dyson and thought we were blissfully happy together, but the SuctionSeal 2.0 tempted me with this: “Epic mess? Bring it on!” Challenge accepted. 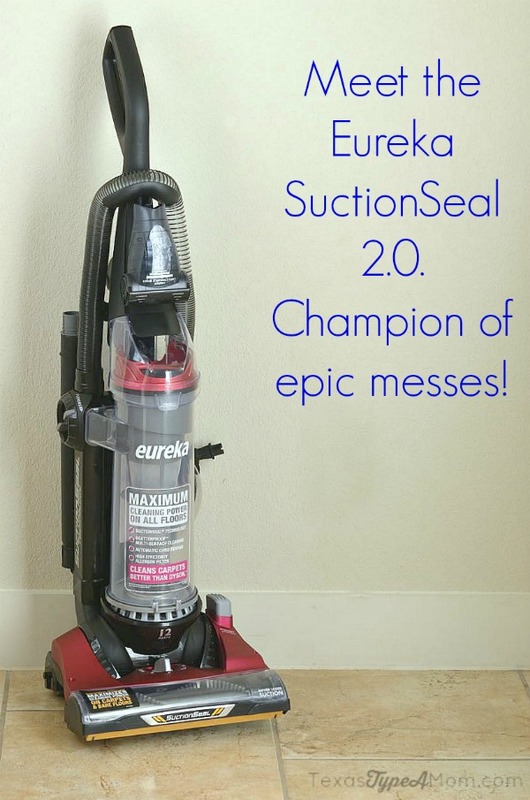 Claiming that it cleans carpets better than Dyson is a tall order, but the Eureka SuctionSeal 2.0 delivered! Using Air Speed technology, it easily sucked up all of the minuscule pieces of cloud dough. The SuctionSeal’s plates that raise and lower against the surface, in this case tile, allow it to maintain suction and seal without scattering the mess everywhere. And when its on carpets, the brushroll spins to ensure a deep clean. You really have to see the suction to believe it – I sucked up a sock and the corner of my sheet while vacuuming! Make sure to pick up all those tiny Legos before vacuuming because if you don’t, the Eureka SuctionSeal 2.0 will. My house is 70% tile, 20% carpet, and 10% area rugs, so I have a lot of different surfaces that need to be cleaned and there is just so much to love about how simple it is to do them all with this vacuum! Not only does this vacuum clean carpet, rugs, and tile, it also can clean hardwood, laminate, and upholstery! 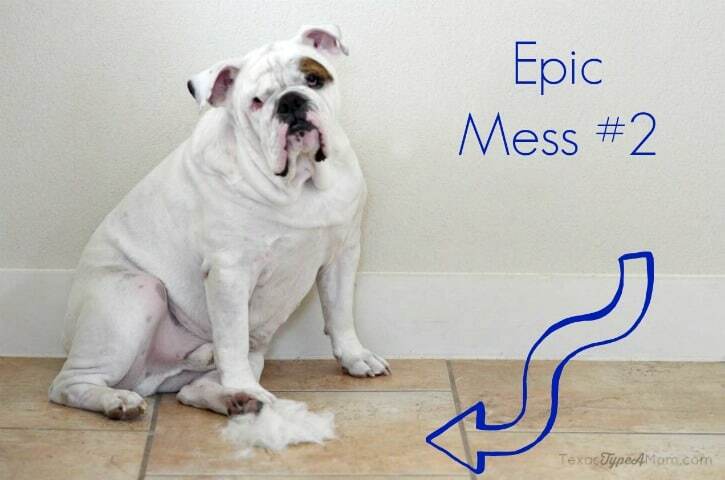 One mess that I’m constantly battling is dog hair (aka epic mess #2). My English Bulldog, Dude, is not only a shedder but his hair is barbed which means it gets stuck in everything…even tiny feet. So ensuring that our floors are as relatively dog hair free as possible is a priority. I have to admit, I was prepared to be disappointed by the SuctionSeal 2.0. I couldn’t imagine how a vacuum that was only $129 could rival and surpass a vacuum that’s 4x the price, but it does! Its already pretty lightweight in my opinion at only 16.5 pounds, but Eureka makes carrying it upstairs even easier with a special carry handle. Forget constantly unplugging and plugging back in thanks to the long, 27-foot cord with automatic cord rewind. 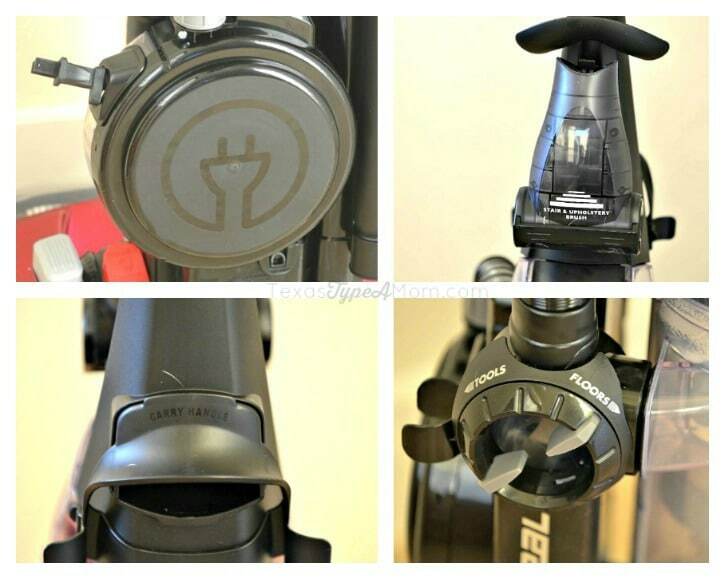 Switching the vacuum over to the accessory mode is as easy as turning a knob. My husband really loves the design and suction of the stair and upholstery brush for vacuuming out the cars. These are the features that I didn’t realize I was missing that now I don’t know how I could live without! What’s the most epic mess you’ve cleaned up? I have a built in coffee bar in my home and I’ve been known to get coffee grounds…well pretty much everywhere, LOL! 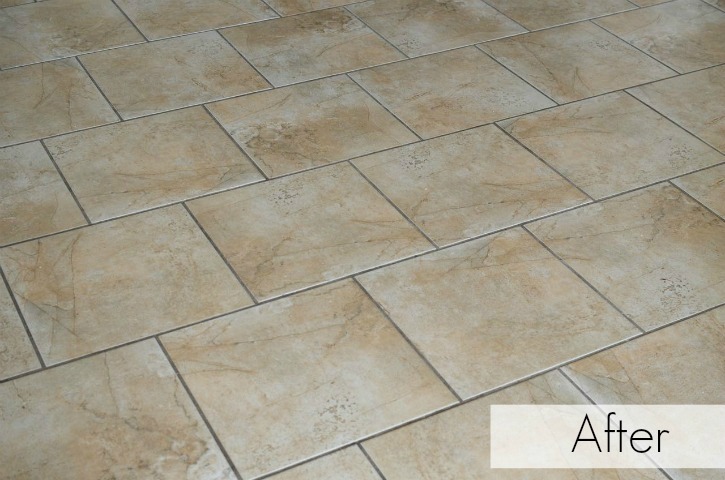 Since we have tile floors in that area, everything gets stuck in the grout – I need great suction from a vacuum cleaner to get all that mess up! I could definitely use that in my life. Sounds like an awesome vacuum. That is awesome! I bet my kids would have a blast with the colored dough! I love this vacuum! It picks up everything. I’ve made that dough before and can attest to the mess and the cleanup! 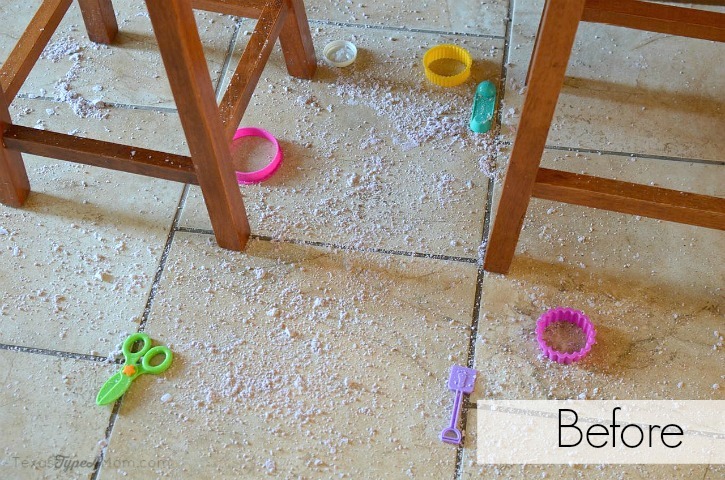 That also looks like my floor after mealtime with my little ones- haha. I have this vac too and it is awesome. That dough looks like a LOT of fun! I think I’ll make it for my boys over Christmas break! AND I have the Suction Seal, so I won’t worry about the mess that it’ll leave behind. That’s the best gift! oh my gosh. I was so excited to make the dough until I saw that before pic! That gives me complete anxiety!!! LOL. Fun, I have never made this but I know the kids would love it. And this looks like a perfect way to clean up the mess! What a fun craft! I love the colors. My kids would definitely enjoy. I have a Eureka vac and love it! It is amazing how the most fun crafts seem to be the messiest. We made a gingerbread house today and ended up needing to clean dried icing off the floor. It is great to see how well it works on tile. Superkiddo’s art projects, crafts, sticky snacks, and dogs pretty much rule around here, and my tile takes a beating. Wow, you have a Dyson and went with another model? Impressive I have to say. Now I am going to have to check it out as I don’t want spend the money on a Dyson any time soon! My mom wants a vacuum for Christmas, so I might just have to get her this one.